Previous PostWhirlwind at Art Basel Miami Next PostMuseum as Hub: ENDNOTES: Was it a Question of Power? 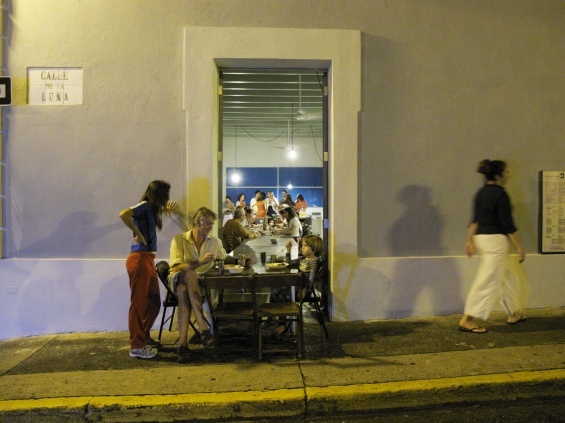 Beta-Local is a nonprofit center for contemporary art initiated in 2009 and located in the heart of Old San Juan, Puerto Rico. I met the three cofounders, Beatriz Santiago Muñoz, Michy Marxuach, and Tony Cruz in 2010 in their storefront space, which was filled with long tables and chairs, surrounded by bookshelves packed to the brim, sofas, and a small kitchen. While Beta-Local doesn’t exhibit art, it is an essential site that fosters interdisciplinary production and dialogue within Puerto Rico. While I was there, international visitors (myself included) were using the space to have studio visits with local artists; meanwhile, the São Paulo-based artist Carla Zaccagnini led a course. In a time when the university system in Puerto Rico is especially volatile, Beta-Local has become a safe haven for artists and others interested in education and exchange. I was invited to interview Beta-Local for Museum as Hub, who feature the space in their Art Spaces Directory. Ruba Katrib: Can you talk a little bit about why you started and what you consider to be the central focus of your program? Beatriz Santiago Muñoz: Beta-Local grew out of our interest in rethinking aesthetic thought and artistic practice from our local context. We began the project in 2009, during the economic crisis. We viewed the lack of local institutional support structures, such as contemporary galleries, museums, and art schools—along with the crisis in traditional modes of production and art economies—as an opportunity to develop alternative support structures for art and vernacular pedagogies. We insist on artistic practice and aesthetic thought as an essential social and political practice part of life. Beta-Local is organized around three main programs: La Práctica, a nine-month production-based program, The Harbor, a residency program, and La Ivan Illich, an open school through which anyone can propose a class that they want to take or teach. These three programs generate many independent projects from performances to seminars, concerts to collective meals. Our most important role is to support artists in making work. This making/thinking happens in the midst of projects, classes, lectures, and research. The multiple directions that the conversation can take can be disorienting, but we think this is a good thing. We wanted to create a space that supported art-making—very broadly defined—and we wanted to do this while responding to and rethinking our physical context, the places where we live, our relationship to the people we collaborate with, their abilities and interests, as well as their imaginative visions of what was possible. We wanted to think about and create links across disciplines, and find connections between artistic practice and other ways of thinking and doing. When we began the project, it was important for us to emphasize the lack of functionality in institutions, not a lack of exhibition space. We really looked to bring home the point that if there was no functionality in institutions, if the museums provided neither the resources, the relationship to a public, nor the critical context, than your living room—a street corner or a factory was just as good or perhaps an even better space for exhibition/presentation. We also wanted to de-emphasize the exhibition as the only point of contact between public and artist by opening up the process of production to the public, and allowing it to be challenged and enriched in the process. We do actually orchestrate exhibitions/presentations when that is the logical end result of a project. We have brought in Alia Farid, a young curator living in Barcelona and Kuwait, to work with artist Rosalin Suero on the exhibition “Almacén/Habitación,” which took place in an industrial park. We also collaborated with the local Association of Architects to present Ashley Hunt’s lecture/performance Notes on the Emptying of a City and we presented Jeanine Oleson’s performance La Gran Limpia in contested public spaces and published a related text—these are just some examples. Generally, we don’t present work in our space; this forces us to create collaborations and open up other spaces for art. In general, these spaces have the resources, the space, and the electricity bills, they just don’t have the programming. RK: With these different components comprising your structure, how do you balance the courses and workshops that are initiated by Beta-Local (that have your interests in mind) with the more “user-generated” elements of the program? Do these aspects of the program correlate or do you see them as separate initiatives entirely? BSM: It is very hard to disentangle the two as there is a certain flow and synchronicity between them. Beta-Local has some clear interests—they are evident in the structure of Beta-Local, in the physical space, in our personal work as artists and cultural producers—but as the community of participants grows, those interests also grow, overlap, and meander. We follow our interests, but we leave all sorts of doors open for others to do the same. We are moved by the commitment of others to their own work and vision. For example, we have received a lot of proposals related to bike culture, from mapping routes to bike mechanics. There is also a community of architects who are interested in experimental practices and architecture as research who participate regularly in programming, proposing, and leading classes; we have had classes and lectures proposed by economists, neuroscientists, ninety–year-old cooks, and teenagers. 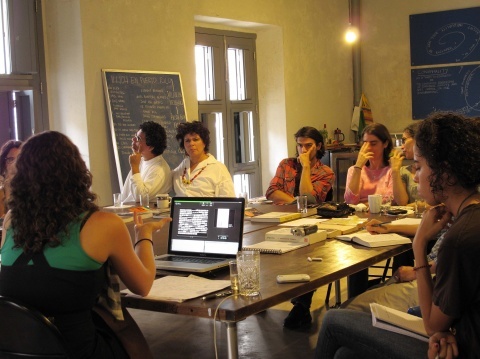 During 2011–12, we had a movement researcher participating in La Práctica. She initiated a project that involved the participation of many dancers, improvisers, and other movement researchers. This project opened the door to a local history of movement practices and all of a sudden we were in the middle of the dance community—not a place we could have anticipated at all. Similar instances have happened, all branching out in many directions—the space attracts like-minded people from other disciplines. On the other hand, we also have found ways to pursue a sustained investigation into ideas of interest to Beta-Local. This year, we have begun a new series of intensive seminars anchored in our specific geography, local knowledge, and emerging art practices. This January, we are holding our first two-week session on the subject of land, place, and its visual representation. The ways in which our landscape is read and reinscribed through images is a subject that has come up a lot in the work of artists that we admire. The seminar puts together geographers, artists, and others who have been working on these ideas, including Chemi Rosado, Javier Arbona, and many others. We hope it will be the first of many. We have also pursued research and collaboration into experimental pedagogy, and have sustained long-term collaborations with artists and researchers whose work we are interested in exploring more in-depth. In the most practical sense, we can do this because we are wiling to literally and figuratively lend them the keys. During our first and second year, we had so many proposals for courses (interesting ones!) and programming that we had to decide early on how to handle this. We would have collapsed if one of the three of us had to be there for everything. Andrea Bauzá, an architect who participated in La Práctica during our first year, organized an eight-week course on architecture, public space, and activism. We gave her the key to the space and from that point on we have done it many other times. On the one hand, it solves a practical problem, on the other, it really gives programming autonomy to the public school project. Also, all La Práctica participants have the ability to program the space and pursue their interests through programming. As we bring more people in, we have more and more reliable collaborators who can run programs, create projects, and teach classes. RK: How do you believe Beta-Local’s program is perceived locally? There is a dynamic community of artists, curators, and collectors in Puerto Rico, what role do you think your program plays in the local art scene? BSM: We have been very lucky to have the support and collaboration of the local community of artists and curators—as well as architects, designers, and non-art neighbors. They create programs and are our main audience and participants. Without their support and participation this simply would not work. This, in part, has to do with the fact that the public or La Práctica participants propose at least half of our programming. Establishing a steady connection with collectors is a bit trickier. We are not a traditional presenting institution. Some unconventional collectors avidly support our programs and regularly participate in events. We have also collaborated with Espacio 1414, a private collection, in creating a public program, which was very successful. But more conservative collectors may still be working on figuring out what we do and how this supports a healthy art community. Our place in the local ecosystem is as an engine through which new art and other relationships are forged, tested, and experimented with. RK: Beta-Local is very integrated into the regional fabric; much of your program is a direct response to the immediate needs of the community in San Juan. But you also have international aspects to your program, how do you connect and communicate your activities to a broader contemporary art context? BSM: We invite artists to Beta-Local whose work has interesting ties to or challenges local practices, Ana María Millán/Helena Producciones, Amílcar Packer, Carla Zaccagnini, Pablo Guardiola, Adriana Lara, Alia Farid, Center for Land Use Interpretation, Felipe Mujica, and many others. All of these artists and projects create very different kinds of work, some are very formal and material based, others are more research based or politically oriented—but we choose to work with them because there is either a kinship with the most interesting ideas and forms developing locally or because they challenge our ways of working. We are creating a critical context for this work—we want it to be discussed, to be challenged, and to push it further. This happens by putting artists together, creating connections between their work and others, and supporting the development of new work and ideas. We also think that what is happening here is important to the larger international art conversation, precisely because many of the art world givens are not operational here. RK: How do you sustain the program? I think you have a couple of interesting ways of raising money while building a community at the same time, as evident with your dinners. BSM: Our funding comes from a variety of sources. We started organizing community dinners in order to cover the costs of travel for visiting international artists. It is a lot of work, and initially we questioned the wisdom of spending so much time and energy on them. But they are so much fun and draw a lot of people that otherwise would not come—especially neighbors who were art-shy and people with kids. All sorts of people come and put their $10 in a pot. It is a very heterogeneous crowd. We have also received grants from philanthropic foundations and from individual contributors, as well as some government grants for publications. Beta-Local Atelier is our in-house consultancy through which we have generated operating funds as well. We still sustain the project through a lot of in-kind work, something that is slowly changing. RK: You’ve been operating for a little over three years now, where do you see Beta-Local in the next three? What are the things you aim to change about the program, things you hope to accomplish, and things you want to make sure you continue to do in the future? BSM: Over the next three years, there are some aspects of the programs we want to grow: we want to be able to work on longer-term projects with resident artists whether that is through developing new work, research, or programming. This year, we are doing this with Center for Land Use Interpretation, Johanna Gustavsson, Sofía Olascoaga, and others. We are interested in what happens when there is a deep involvement with the place. We also want to make La Ivan Illich, the public school, a better-known tool throughout San Juan. We plan to expand the understanding of it as a space to practice and generate new pedagogical approaches at all levels and to generate alternatives to current education systems. I think we are also going to be getting deeper into publications, and we want to create more ongoing collaborations with organizations and spaces in order to give La Práctica participants more tools—whether that is access to a workshop or studio space. One thing we have to make sure we do is to create space to look back on the project critically. We hope to do this by integrating new directors into the space, this year we’ve brought on Alia Farid and Pablo Guardiola, who come to the project with fresh eyes.